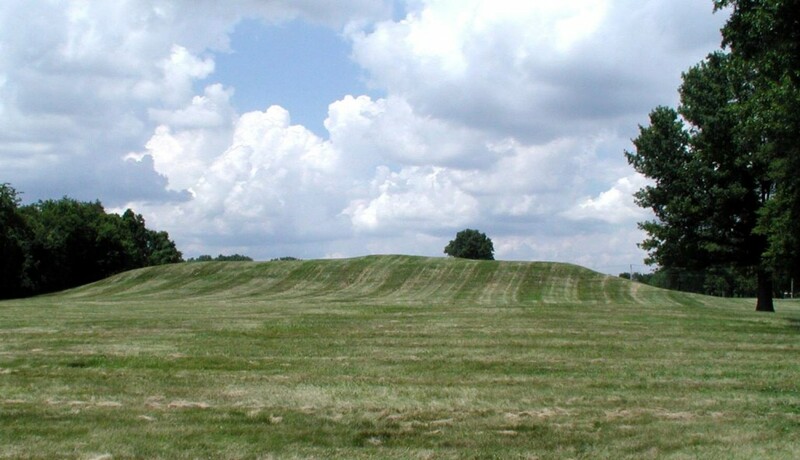 Mound 48 is one of the larger mounds of the Cahokia site. Its modern contours are nearly square with a flat top. An elevation to the south of the platform’s center may be the remains of a farmhouse that stood there in the early 1920s; when Moorehead and his crew worked in the area in 1921 they used the farmhouse as headquarters (Moorehead 1929: 33). The mound is oriented to the cardinal points. There is a slight ledge or step terrace on the east edge, though the west edge is much steeper in grade. Using the 129-meter (423.2-foot) contour as a base for measurement, the 1966 UWM Map indicates that the mound is approximately 112 meters (367.4 feet) north-south and 111 meters (364.2 feet) east-west. The mound’s height has been recorded by various mappers and investigators. Patrick shows this mound in cross section with a height of 25 feet (7.6 meters). The McAdams Map of 1882 indicates 30 feet (9.1 meters); the Thomas Map of 1894, 25 feet (7.6 meters); and the Peterson-McAdams Map of 1906, 20 feet (6.1 meters). Using the 129-meter elevation as a base line, the 1966 UWM Map shows a height of 7.5 meters (24.6 feet). The 25-foot height recorded by Patrick and Thomas is probably closer to the actual original height. Bushnell also discusses this mound (1904), recording a height of 25 feet (7.6 meters). Mound 48 was probably the mound upon which the Trappist monks built the majority of their buildings. The survey to which Bushnell refers is undoubtedly the Patrick Map survey. Several investigators and early travelers locate the monks’ building on a mound west of Monks Mound, referring probably to Mound 41. Bushnell, however, very specifically recorded the mound’s location, which corresponds with Mound 48. None of the evidence is specific enough to locate positively the position of the mound upon which the monks built. Most agree, however, that the Trappists did not build upon Monks Mound itself. Excavations into the surfaces of Mounds 41 and 48 would likely determine exactly the location of the monks’ structures. The surface of Mound 48 was apparently disturbed by more recent construction of the farmhouse as indicated by Moorehead’s description. The farmhouse on Mound 48 is shown in one of the Goddard photographs (Crook 1922). In 1995, a joint field school from Southern Illinois University-Edwardsville, under Dr. William Woods, and the University of New Mexico, under Dr. Robert Santley, excavated nine 2m square test units around the north, east, and south sides of the base of Mound 48 and placed several cores on its summit. In the test units they could see natural layers of clay and sand beneath the premound construction surfaces. These soil layers were then buried by relatively thick construction layers, which in turn were buried by a thick layer of colluvium or slopewash. There was evidence of premound stripping of the surface. The majority of the features encountered were in the three units to the south of the mound, where structure basins, pit and post features, and a possible screen/fence trench were found. The southwesternmost unit had several layers of midden deposits with exotic materials that may have been deposited in cleaning the elite residence(s) that probably were on top of the mound. There were fewer features on east (Grand Plaza facing) side of the mound. The stratigraphy in the unit by the northeast corner of the mound suggests there possibly was a ramp at that location. The coring units placed through the mound suggest construction of Mound 48 was a single event, probably during the Lohmann phase.